den Marts 29, 2018, 2:51 p.m.
With one year to go until Brexit, much time has been spent looking at how Britons feel about the impending divorce, but there has been far less focus on how the people of the continent view the matter. Now data from YouGov’s latest Eurotrack survey shows the extent to which Europeans want Britain to stay in the EU, and what they think Brexit means for the body’s future. With six European countries polled, there were clear majorities in four expressing a desire for the UK to stay in the EU: Denmark (63%), Finland (59%), Germany (58%) and Sweden (58%). The people of France and Norway are divided on the matter, however. French people are split 36% to 32% in favour of Britain remaining a part of the bloc, while Norwegians are likewise split 34% to 32%. Will Brexit leave the EU better or worse off? 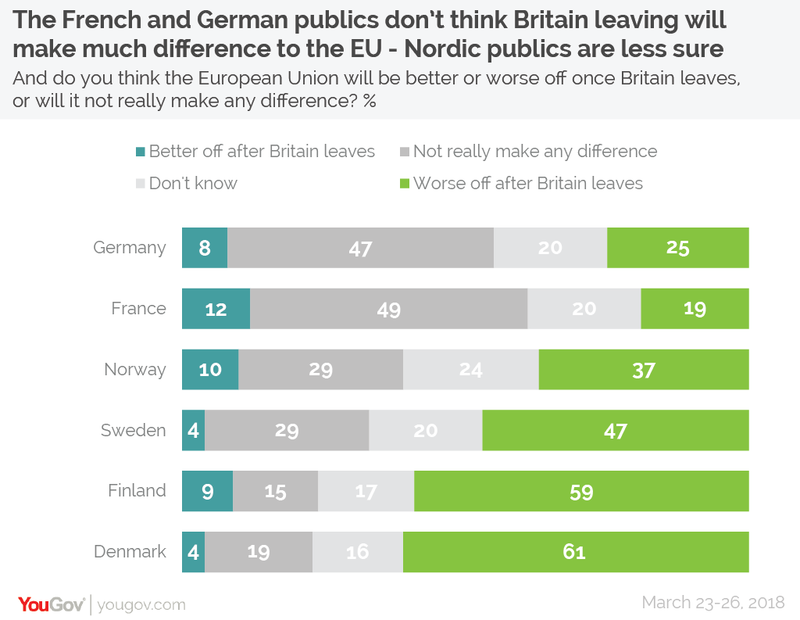 The French and German public don’t seem to see Brexit as likely to make a big difference to the EU, with 49% and 47% respectively. Only 19-25% of the public in those nations believe the EU will be worse off for the loss of the UK. The Nordic nations, by contrast, tend to think that the EU will be diminished by Britain’s absence. This view is particularly strong in Denmark and Finland, where 61% and 59% respectively believe the EU will be worse off without the UK. How do Europeans feel about Britain leaving in one year? Worry and indifference are the most common emotions expressed by Europeans regarding Brexit. Given they are the most likely to think that the EU will be worse off without the UK, it is no surprise to see that the Danes and the Finns are the most likely to be worried by Brexit, at 37% and 32% respectively. The French are the least worried (15%), and concurrently the most nonchalant about Britain leaving the EU, with 40% saying they have “no feelings” on the matter. Perhaps because their own nation is not a member of the EU, the Norwegians are notable for having a higher proportion of people saying they are “relaxed” about Brexit, at 21%.